Helen Dunn grew up, an only child, in an environment that was almost 19th century. She lived on dirt roads and learned to read by a kerosene lamp as the house they lived in at that time had no electricity. Until she moved from her parents home, she lived with an icebox not a refrigerator, and although they graduated to a gas cook stove, she can still remember her mother cooking on a wood burning cook stove and ironing clothes by heating the iron atop that stove. Her Dad farmed with mules until around 1950, so she experienced riding in a wagon pulled by mules and riding on the back of a mule. As a youngster, she helped bring the cows in from the pasture, learned to milk a cow and a goat, went poke picking with her mother and hand-picked cotton in the fields. As an adult she lived in large cities but in her mid fifties she and her female partner of many years moved back to the country, where they greatly enjoy the peace, quiet and space. 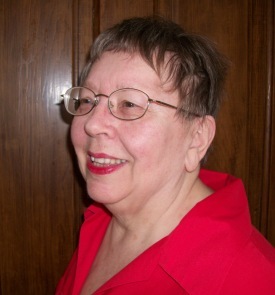 Readers who are interested in romance, humor, historical, or paranormal/supernatural themes in lesbian fiction, are invited to visit Helen Dunn’s Author’s page at amazon. Chatting with Helen revealed we have a lot in common and she had great advice for authors. What is the biggest challenge you face as a writer of lesbian fiction? Titles. Trying to come up a good title that fits the story is nearly always tough for me to do. EG: Me TOO! If I don’t start out with a title then I suffer and struggle to get one at the end. Tell us something no one else knows about you. When I was still a child, my mother would read Charles Dickens novels to me, which instilled an appreciation of literature in me. EG: I love that. I have fond memories of my family reading together. It was a tradition I continue today. Do you ever feel moments of “burnout” and if so, What do you do to keep your writing fresh? There have been times I have thought – this will be the last story I ever write – I am totally out of ideas. Then I go digging out old manuscripts that are a complete mess and it’s a rewarding challenge to see if I can turn them into something far better than they were originally or else I see something that will inspire me to do a completely new story. EG: I’ll remember this advice. Sounds like a great plan to keep energized. I make files with notes on possible stories so I have plenty of fodder to browse when I need this boost. When did you start writing and what kicked off your passion to be an author? I was 9 years old and I wrote my first story on the blank backside of a calendar. Back then, which would have been around 1949, calendars did not print their information on both sides of the pages. I wish I still had the story, but it went missing many years ago what with our many moves from farm to farm. The story was about a brother and sister, close to my own age, who were staying with their grandmother. Their widowed father, however, re-marries and they go to live with him, their stepmother and their step-siblings. There is quite a bit of friction with the step-siblings, who as near as I can remember, were sort of bullies. I did not write more until my teens.Graduating at 16 from high school caused me some difficulty in moving out into the world. I was an only child and had lived an isolated life with my parents and all the moving had left me traumatized. I think my passion for writing came about as a way to keep my sanity and express my feelings during those lonely years in my late teens when I was trying to get myself together. EG: Oh Helen. I graduated early too. I became an emancipated minor and as an only child had a bit of struggle to find my place in life. Sounds like writing saved you! 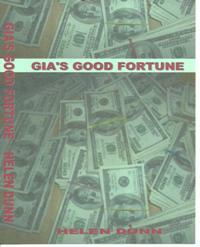 Blurb: Gia Hulp comes across a wrecked car, a dead driver and a big bundle of money. The temptation is too much to resist. Unity Kessler, beautiful, savvy lesbian investment powerbroker, wants this money back if only she can discover who took it. A good natured, bumbling trucker might have the answer to that question if Unity can get him to focus, but that’s going to be like pulling hen’s teeth. EG: I’m hooked from the blurb! The vintage red Lamborghini flew past Gia Hulp’s car as if she were sitting still. “Idiot!” Gia declared, “Where the hell does he think he’s going in such an all fired hurry—cemetery most likely.” She added, as she kept her own vehicle at a steady 55, no more, no less. She’d had a perfect driving record for more than some 20 years, and was rather proud of the fact; although if she allowed herself, she did have more than a trace of envy regarding the red Lamborghini. Fifteen minutes later, Gia saw the missing guard rail, where it had been torn out with three of the support posts gone. “I knew it! I knew it!” Gia muttered under her breath as she slowed down to see if there was anything she could do. Climbing out of her car, she went over to the edge of the road where the car had shot through the railing. Below, she could see the red Lamborghini, the front of it crunched up like an accordion against the huge trunk of an enormous pine tree. A snowman would have a better chance in a furnace than whoever’s down there, Gia thought as she began a careful descent down the extremely steep slope towards the wreckage. It didn’t take long after she arrived at where the Lamborghini had come to a halt to realize there was nothing anyone could do for the person inside the car. Air bags had not been available the year this car had been made, and he wasn’t wearing his seat belt. Consequently, the driver was squashed against the steering wheel; his head a bloody, battered mess from where it had hit the windshield and then bounced back from the impact. Gia turned away feeling somewhat nauseous at the sight. “Poor devil didn’t stand a chance.” She whispered to herself. The passenger door had sprung open. Perhaps there was someone else, who had been thrown clear, although Gia didn’t have much hope for them either. She figured she’d better at least look around. Stumbling around in the weeds on the uneven, rocky ground, she searched for several yards but saw no one. “Eh? What’s this?” Gia said to herself, as she came back to the car and spied the black leather carrying case. She bent down to pick it up and noticed the catch had come loose, that was when her eyes beheld the dull green paper inside. “Whoa!” Gia exclaimed, as she opened the case completely up and stared at the neat rows of bundles upon bundles of currency. It was possible he had robbed a bank, but somehow it seemed unlikely given the clothes he was wearing and the expensive car; unless he had robbed several banks with a different look than what he now sported and a less noticeable car, Gia surmised. Well, she’d just hang onto this for safekeeping and listen to see what was on the news, she decided. This entry was posted in Uncategorized and tagged Gia's Good Fortune, Helen Dunn, Humorous Lesbian Fiction, Lesbian Fiction. Bookmark the permalink.